Experience Victoria Falls and Hwange National Park on a 5-day tour through Zimbabwe’s most iconic landscapes. Watch for hippos and crocodiles on an evening cruise of the Zambezi River, then tour the falls’ thundering pools and misty rainforests. 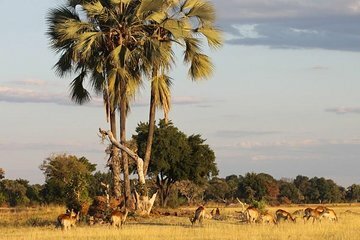 Travel to Hwange to relax at a backcountry lodge and take morning and afternoon game-viewing trips into the country’s largest park; watch for Cape wild dogs and the Southwest African lion as you explore a thriving woodland on the edge of the Kalahari Desert.